Psychology is a subject area about which most students are very curious. Thus, they generate many questions about the mind and human behavior. This was very apparent in my psychology course when I surveyed the students at the beginning of semester, asking what they want to know and hope to learn. Because this course at ACS is only a semester long, we only have a short time to investigate foundational elements of psychology (I modeled this part of the curriculum after the IB Psychology syllabus by investigating Biological, Cognitive, Sociocultural, and Abnormal Psychology). However, I don’t want students to leave the course without having the opportunity to investigate answers to questions with which they came into the class. In response to this, I developed the Personal Project which incorporates Google’s 20% time concept and builds their sense of curiosity, an important habit of mind in today’s world. Chose a topic area where you’d like your investigation to focus. (I differentiate this aspect and leave this open for the students to define a topic in which they are interested. I do provide a list of topic areas that I and previous psychology students have found interesting to help students that are stuck). Generate a research question that will guide your investigation and get it approved by the teacher. (This part of the process is very important and will drive the research the students do. I work closely with them to develop a question that will have them working higher level thinking skills, not just a summary of a topic or question that leads to a simple yes or no response). Write an annotated bibliography for at least 5 sources relevant to your research question. (I feel this is an important academic process since I can check that they are thinking deeply about the sources they are using. This is a process they will do often in university, so it’s good practice for that, as well. This part of the process is assessed as a formative task). Chose the type of product you will create to show the findings of your investigation (product possibilities: documentary style video; website, podcast, online magazine style report, VoiceThread, research report, TED talk-like formal presentation) (I differentiate the product, as well. I want the students to push creative abilities and build technology skills in this project, so I guide them to technology-based products that have strong creative elements in them. This is not an exhaustive list of possible products, however. If a student has a different product idea, they can definitely pursue that upon approval. I only allow 3 students to do a traditional research paper style product since this doesn’t really push creative abilities. They must give a good reason for wanting to do a traditional research paper. I provide links to examples of each product type so students can make an informed decision). Write an outline or storyboard that organizes your content in context of your product. (Organization and planning! This part of the process is assessed as a formative task). Submit your final product and celebrate during a show and tell! (Students that choose to do the TED style formal oral presentation do it on the due date. After those presentations, the other students share their products. Self-assessment and reflection will also occur upon completion of the product). Students have chosen some very interesting topic areas this semester and are working well through the process so far. They are showing excitement and motivation to work on this since they are in control of what they are learning and creating. My role is as a guide, helping them work through the process, refining their understanding of the topic and related research, providing feedback, and assisting with technicalities relating to their product production. I plan to implement this concept with my IB Geography Higher Level course in the second year of the class when we are learning the options. Students need to know three options for that course. I will facilitate two of the options, then the students will chose a third option based on their personal interest. I will structure the time and process similarly to how I’m doing it in my psychology class. If you are using the 20% time concept, I’d love to hear your comments and how you are facilitating the process in your course! I’ve been directing or advising Model United Nations (MUN) teams for 11 years now, beginning when I first went overseas to Bahrain in 2000. I’ve taken students to many conferences in Europe and Asia and I’ve helped host conferences in Beijing and Shenzhen, China. I’ve enjoyed facilitating and training MUN teams since it provides a great opportunity for students to experience how international diplomacy works and how nations work (or sometimes don’t work) together to solve the world’s most pressing issues. They also get to practice research, collaboration, and communication skills. The most recent conference I attended with students was from November 15-20, 2011, taking eleven high school students to the 7th annual The Hague International Model United Nations (THIMUN) conference in Singapore, hosted at the Hwa Chong Institute. This was my third time attending THIMUN Singapore. Because of a growing interest in the MUN program at SIS, students had to make it through a rigorous tryout process in order to be chosen for the trip. About 40 new and experienced high school MUNers tried out, vying for 22 spots on the two teams. Along with developing their understanding of the United Nations and the parliamentary procedures involved in MUN, students had to prepare for and participate in a mock debate and write a brief position/research paper on the country they were given to represent in context of the debate topic. The successful students participated thoughtfully and wrote thorough papers. 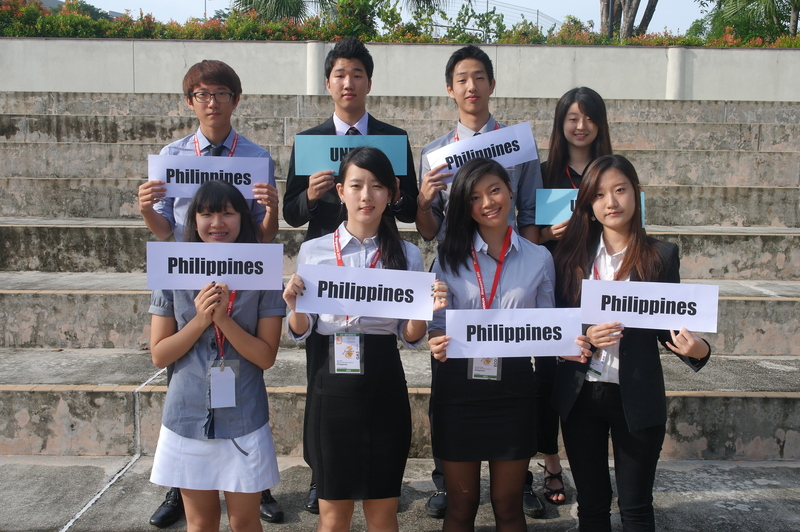 Selected students were placed on the THIMUN team or the BEIMUN team (Beijing International MUN, taking place in March 2012). The eleven students chosen for THIMUN had to get to work right away since the conference was only a couple of months after the tryout. The conference organizers assigned us The Philippines and United Nations Population Fund (UNFPA) as our delegations. So, after assigning each student to one of the delegations and a specific forum, the first step was to do background research on their country or organization. The students did this collaboratively by using the MUN blog. With this background understanding developing, the students needed to get researching their forum topics since these are for what resolutions are created and debated. Each forum has 4-6 topics. A resolution is a formal document that provides preambulatory clauses of background information on the topic and operative clauses of solutions that endeavor to solve the problem presented in the topic. The solutions the students develop must be in-line with their country’s or organization’s policies and perspectives, but still work to solve the problem with a global perspective in mind. Each student was expected to write at least one complete resolution for a topic and at least three operative clauses for the other topics in their forum. Human Rights Council (HRC)– Promoting and protecting the rights to freedom of peaceful assembly and association. All of this year’s issues can be seen here. The first day of the conference saw the students lobbying and merging. This is where students cooperate and collaborate with other like-minded delegations to fuse and build stronger resolutions that can hopefully pass after a rigorous debate once the sessions start. In this situation, students can become the main submitter or a co-submitter of the resolution. The main submitter is the delegate who initially presents the resolution to the forum and gives the first speech about it. A co-submitter participates intimately in the debate, as well, by giving speeches and asking points of information. All SIS students co-submitted at least one resolution, and one student, Christine Lee, was the main submitter of a resolution. Unfortunately, her resolution did not pass. The remaining three days saw the students debating in their respective forums. The students worked vigorously in the debate process to get resolutions to pass. Though not all resolutions received a majority vote, the process and experience each time helped the students understand and evaluate the necessary steps to solve some of the most pressing issues in today’s world. A couple of grade 10 students both went into the conference thinking it was going to be slightly boring, but came away saying its was exciting and fun. One of them mentioned she came away from the conference with a new best friend, a delegate from another school. The other was pleasantly surprised at the professional level in which the student officers and administrative staff ran the conference. All students came back very enthusiastic about their MUN experience, and many want to pursue student leadership positions they we have established in the last year (along with leading the high school conference training, these student leaders also chair the middle school MUN conference we host). 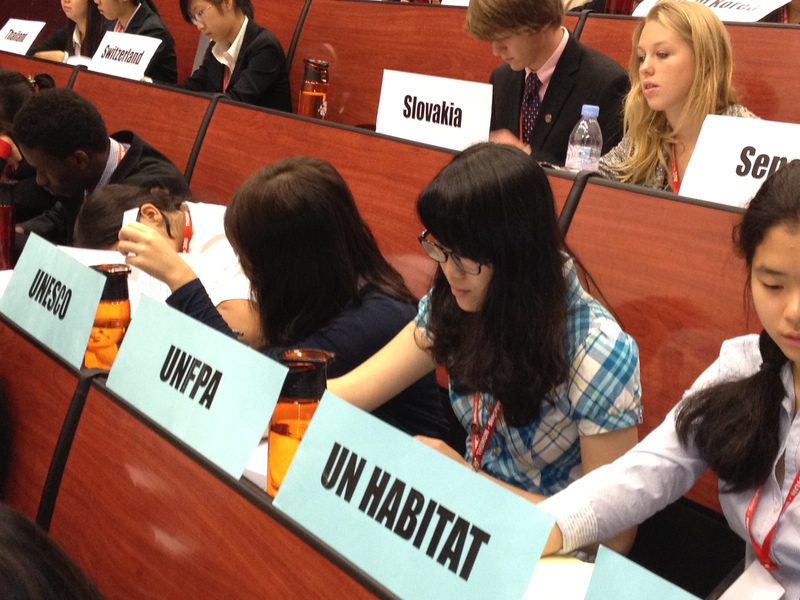 In all, a MUN conference like THIMUN Singapore is a wonderful experience for students. It develops all of my school’s Expected Student Learning Results in the students and they make connections with many other students from around the world, most of whom they will keep in contact for many years to come with wonderful social media technologies like Facebook and Skype. Hopefully many of these students will stick with MUN throughout their high school years. The more they do it, the better they get, the more their confidence builds, and the deeper they understand global issues. Other opportunities related to the student officer team, press team, and administrative staff exist for students.